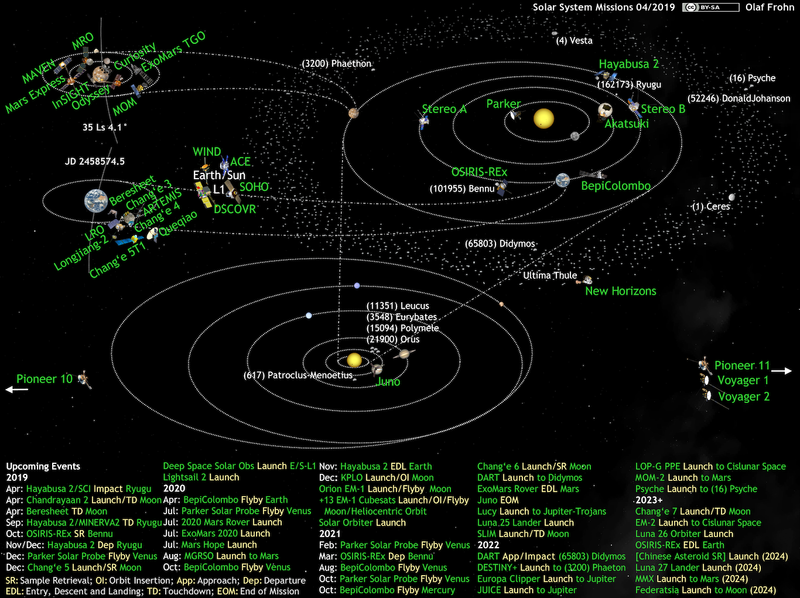 This page features a regularly updated map of all ongoing and future solar system missions and links to their web sites. Position data are mostly from the NASA Horizons database. Upcoming events and missions are noted at the bottom of the map. For the history of Solar System exploration see this page. The data are available on my space exploration history GitHub repository. This is just an amazing information! It is so nice to read such wonderful blog. Wonderful info. Thanks so much! Shin'en 2, launched along with Hayabusa 2 and PROCYON, is going to make an Earth flyby on 4 December. What nation is responsible for the Deep Space Solar Observatory set to launch in 2018? I've tried looking it up on google to learn more about this probe, but the only search results that pop up are for the DSCOVR mission. Could a link to the program's homepage be provided? @Suzuki Akiho Naomi: The DSO is a Chinese mission that will presumably launch in 2018 toward the Sun/Earth Lagrange-point L1, the same as DSCOVR and SOHO, to which it is supposedly about equivalent in capability. Unfortunately it is very difficult to find further details about it, therefore I don¡t have any link for it. All I can find is a listing in the Chinese launch manifest on the NASASpaceflight forum: http://bit.ly/2jqJhom, and a few mentions here and there, like http://bit.ly/2iPbLaH (in Spanish). OTOH the Chinese space program has announced several Heliophysics missions, apart from DSO the Advanced Space-based Solar Observatory (ASO-S) and the Solar Polar Orbit Radio Telescope (SPORT), and it is always a bit guesswork what is just proposed or already approved. It may be time for a reassessment. @Olaf Frohn: Thanks for the info! I promise I have one last question and then I'll leave you alone. I've been following your monthly graphics for 3 or 4 years now, and I've always wondered why you show Pioneer's 10 and 11 as active missions. I'm sure you have a reason, of course, I just don't know what that reason could be! They are, and for a very long time will be, our ambassadors. I lied! I do have another question: why are the Spitzer, Kepler, Gaia and LISA Pathfinder observatories not on your graph, despite not residing in Earth orbit? Conversely, why is SDO on your graph when it is in Earth orbit? Take, for example, the JWST set to launch next year. It will be far removed from the Earth's hill sphere, and will be remotely observing all kinds of solar and extrasolar system objects for many years to come. Those missions you mentioned are all astrophysics observatories for objects beyond the solar system, therefore they appear on my other chart about space missions. As for SDO, that is the one deviation from the 'beyond Earth orbit' constraint, because it sort of forms a constellation with SOHO and STEREO, and anchors the whole zoo on Earth. Quirky? You bet! Thanks for proving such valuable content for us, we appricate your efforts. Apart from this, if you want to read about solar home lighting system, visit Jointsolar.in they are the best in solar manufatcuring. All kind of solar charge controller, solar street lights, solar home lighting is available here. visit to know more.! Works by http://armchairastronautics.blogspot.com/ are licensed under a Creative Commons Attribution-Share Alike 4.0 License.